Welcome to "A Winding Creek" Located in the North Georgia Mountains - Ellijay, Georgia. Mercedes-Benz Stadium is approximately 80 miles away. Sun Trust Park is approximately 65 miles away. Let's go to the GAME!!! 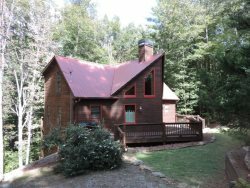 This Vacation Home features 3 bedrooms 2-1/2 baths on a Large Winding Creek resting on 2 acres just 8 minutes from historic downtown Ellijay. Adjacent to the screened in porch is the Gas BBQ Grill on Main Deck with Table & Chairs and Fire Table. Fully stocked kitchen with dishwasher, coffee maker, blender and all other major appliances. A Breakfast Nook off the kitchen with a view of the Creek. The living room has a Sectional Couch, 50 inch flat screen TV, along with a Gas Burning Fireplace. The Master Bedroom is on the main floor. It features a tall King Size Bed, Dresser with a 36 inch Flat Screen TV. Master Bedroom also has a Electric Fireplace. Master bathroom has a walk in shower, a separate soaking tub and 2 separate sink areas. The Second Bedroom is downstairs with a Queen Size Bed, Dresser and a 32 inch flat screen TV. The Third Bedroom is also downstairs with 2 sets of Bunk Beds and a single twin Bed - sleeps 5. The Huge Game Room downstairs features a large sectional sofa, flat screen TV for watching the GAME, a pool table and counter space for food platters with a wet bar, blender and a beverage cooler. From the Game Room, double doors lead to the covered patio sitting area and a lighted fountain hot tub. Beside the Covered Patio, Fur Babies have a private fenced area for lounging. It is complete with a hose for washing off creek feet. Screened in Porch off Living/Dining area. Dog Friendly - 2 small dogs maximun. * Fully Stocked Kitchen * Microwave * Coffee Pot * Refrigerator * Toaster * Dish Washer * Dishes w/utensils * Cooking Utensils * Pots and Pans * Blender * Washer / Dryer * Air Conditioning / Heat * Phone (Local Calls Only) * Satellite T.V * Flat Screen TV in 4 rooms * 1 King Size Bed* 1 Queen Size Bed * 2 Sets of Bunk Beds and a Single Twin Bed * Linens Provided * Living room Gas Burning Fireplace * WIFI Internet access * BBQ Gas Grill on Main Deck with Table & Chairs and Fire Table. 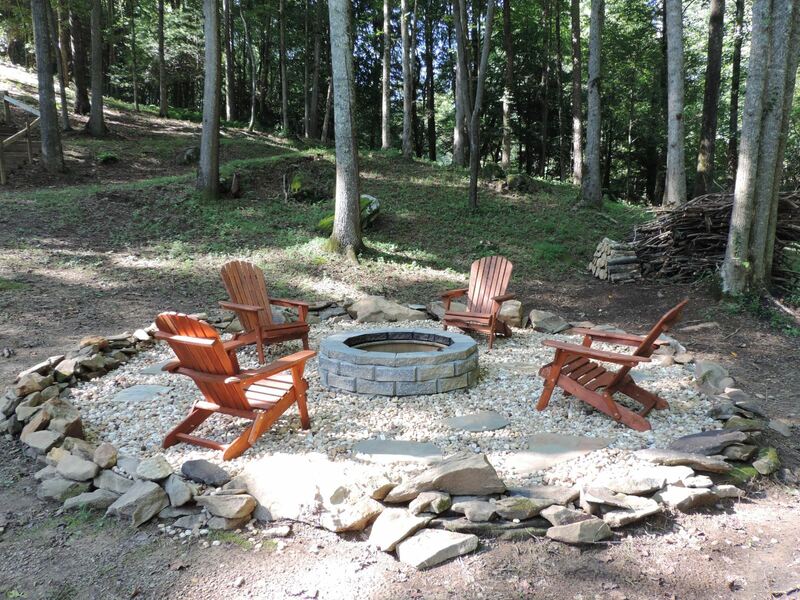 * Lower Deck Has a 6 person Hot Tub * 2 Acres on a Large Winding Creek * Screen Porch with Patio Table & Chairs * Wood burning Fire pit beside the creek and a propane fire table beside the grill. GUESTS MAKING A RESERVATION MUST BE AT LEAST 28 YEARS OLD. BY SUBMITTING THEIR RESERVATION THEY ARE CONFIRMING THAT THEY ARE 28 YEARS OLD OR OLDER. NO LARGE GROUPS OF 28 YEAR OLDS AND YOUNGER. MAXIMUM OF 6 GUEST THAT ARE 28 YEARS OLD IN ANY CABIN. * 2-Night Minimum - Non-Holidays. * 3-Night Minimum - Memorial Day, Labor Day, and New Years. * 4-Night Minimum - Week of 4th of July, Thanksgiving and Christmas. * Small Pets (Dogs Only) - $25.00 per pet / per stay. 30 lb limit/ 2 pet maximun. Guest acknowledges and understands that check-in time is not earlier than 4:00 PM, and check-out time is no later than 11:00 AM on the dates agreed upon. Guest agrees that an unapproved late check-out or early check-in will be assessed an amount equal to one-half of the nightly rental fee. Housekeeping needs the time between 11:00 AM and 4:00 PM to prepare for your arrival. A prepayment of $250.00 of the rental fee, by valid credit card, will secure your reservation with the remaining balance due 21 days before arrival. The same credit card will be used unless advised otherwise. Directions and will be sent via e-mail 1 week prior to your check in. If it is within the 21 day window, you will need to pay the total amount due.